Alert: you MUST try this! I receive emails all the time from sweet people who are trying to eat well, but tired of the same “grilled chicken and broccoli” dinner, and begging me for more flavorful ideas. (which, I absolutely love hearing from you; it is an honor to share in the food struggle, the health victory, and listen to every question that any of my viewers or clients have) I would surely get tired of that, too! The good news is that when you are eating nutritious food made the right way, there should never be a lack of FLAVOR. 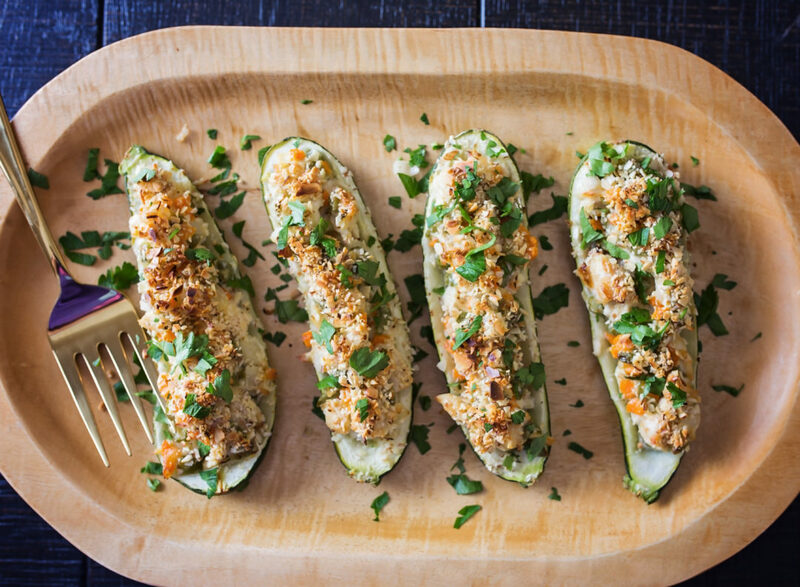 So, I beg of you to try this recipe. It’s simple. It’s different. And it’s absolutely delicious. 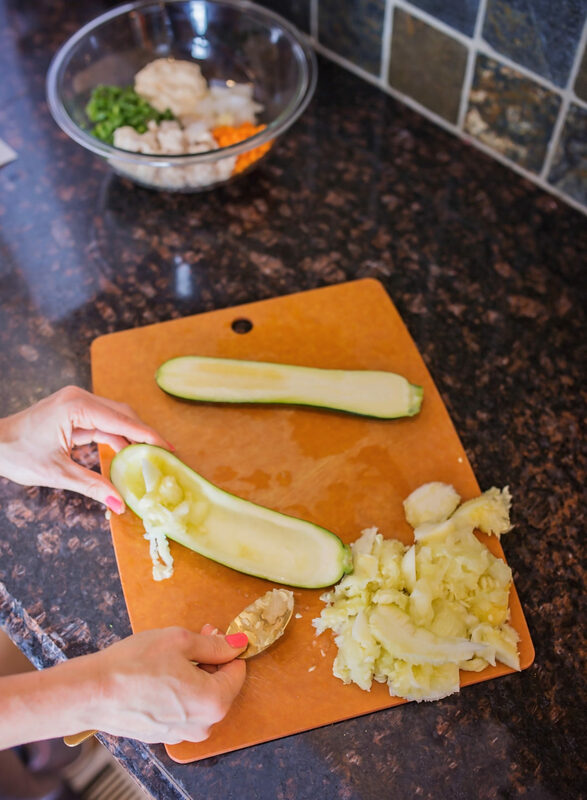 Take some beautiful zucchini, and slice lengthwise down the middle. 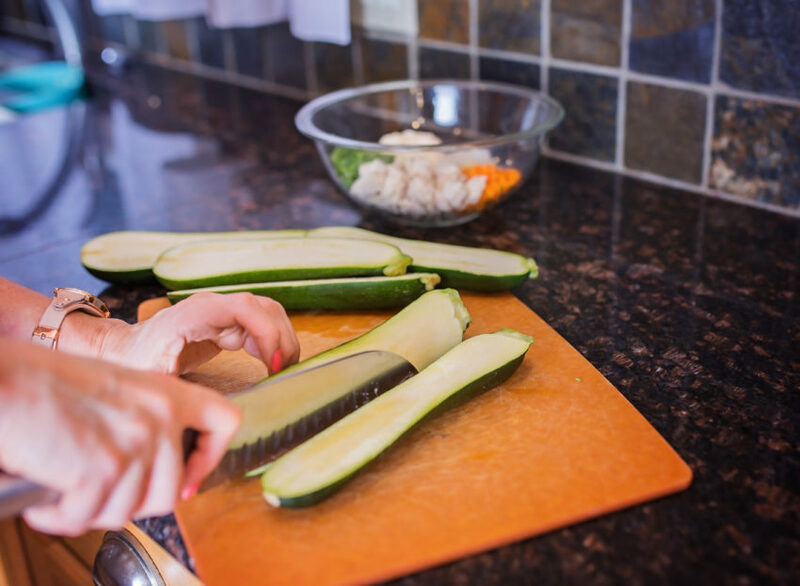 Then take an ordinary spoon, and run it down the middle of the zucchini to make a little “mote” for the chicken salad. 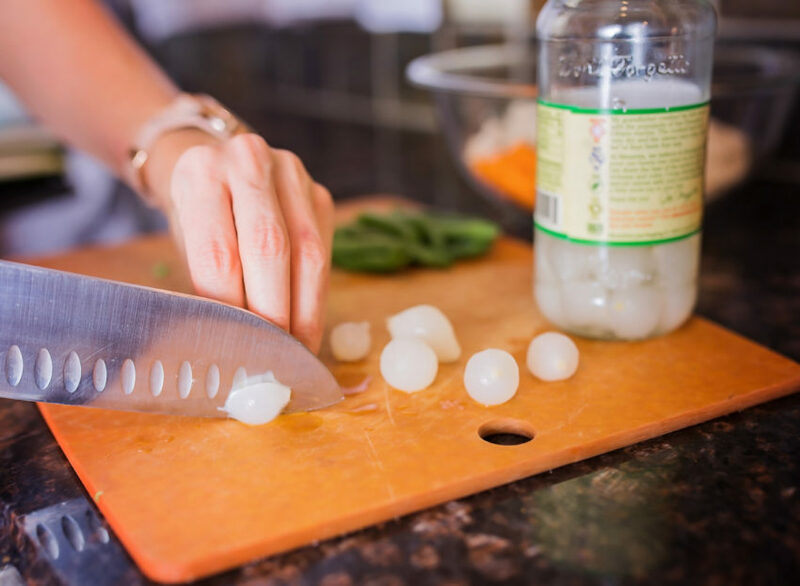 Now for cocktail pearl onions – have you ever used these? To be honest, I had never tried them before. They always just sat on the grocery shelf looking at me as I pass by to grab something else. I finally decided to give them a go. I’m soooooo glad I did. 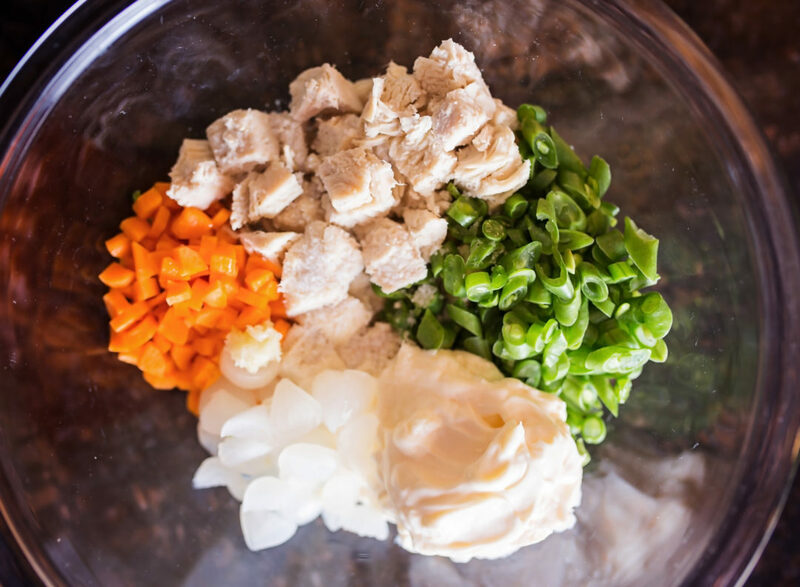 They have a tangy, briny flavor, and add a kick to this chicken salad. 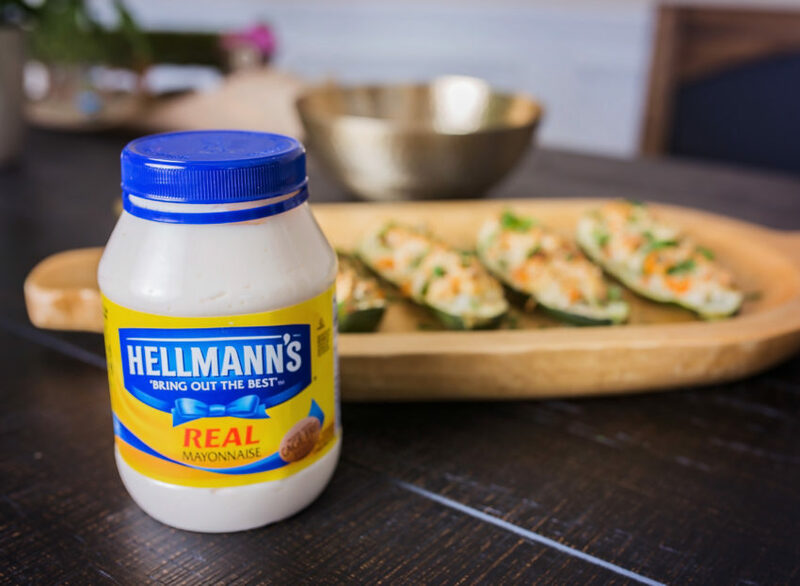 Wrap the whole thing together with my favorite Hellmann’s® Real Mayonnaise. Hellmann’s® is made from quality ingredients that are sourced from trusted American farms (I was soooo happy to learn that!). They use 100% cage-free eggs, as well as plant-based oils that provide a good source of Omega-3 ALAs. I could stop there. In fact, we had to stop ourselves from eating it so we could actually test it in the oven – lol! 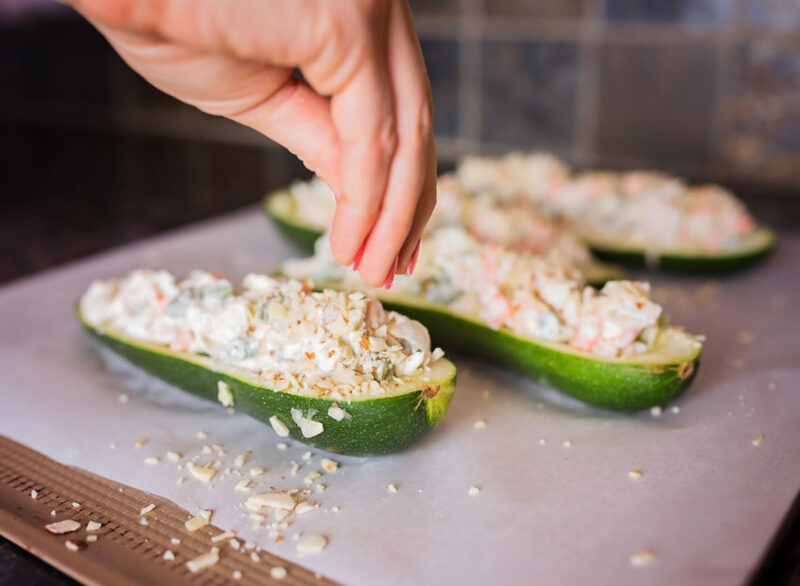 If you are able to get to this part, you will fill the chicken salad mixture into each zucchini, mounding it up a bit in the middle. Then, top with sliced and chopped roasted almonds. Don’t skip that step! Roasted almonds deepen the flavor and bring out a richness to this nutritious and filling dinner. 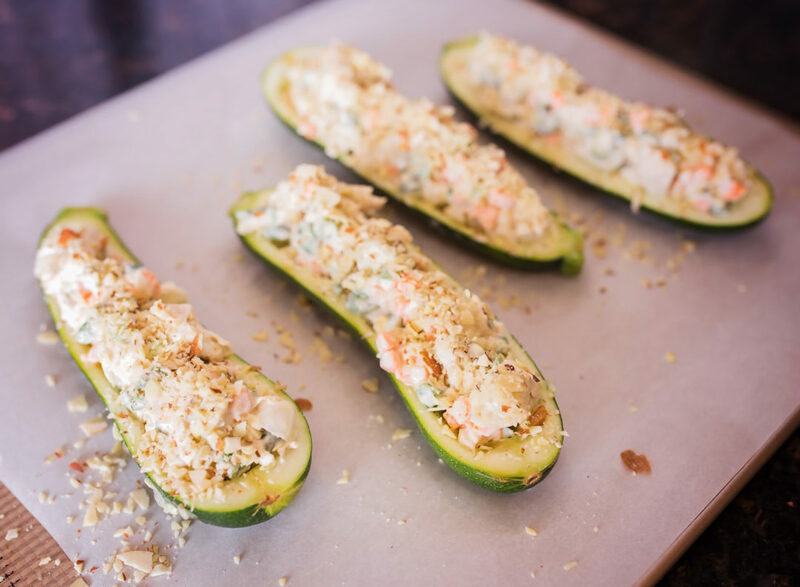 Bake and then it’s ready for dinner…for real this time. When I made this, my team in the kitchen couldn’t stop eating it, and neither could I! I really hope you enjoy it. Please comment below! I give recipes, videos and health tips on Facebook, Instagram, Youtube, Twitter and Pinterest, too. Would love to encourage you there! Make it a great week. 1. 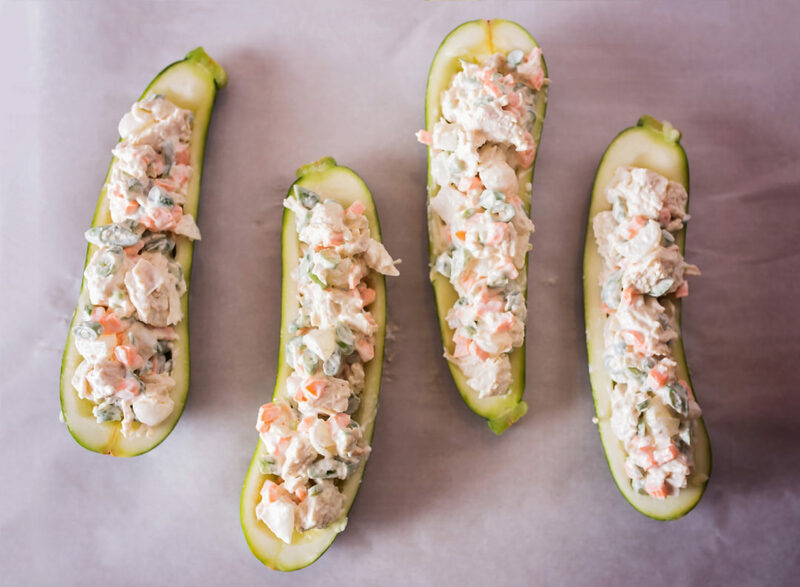 Preheat oven to 375 degrees F. Using a spoon, carefully scoop out the middle of each zucchini half, leaving a well to stuff chicken salad into. 2. 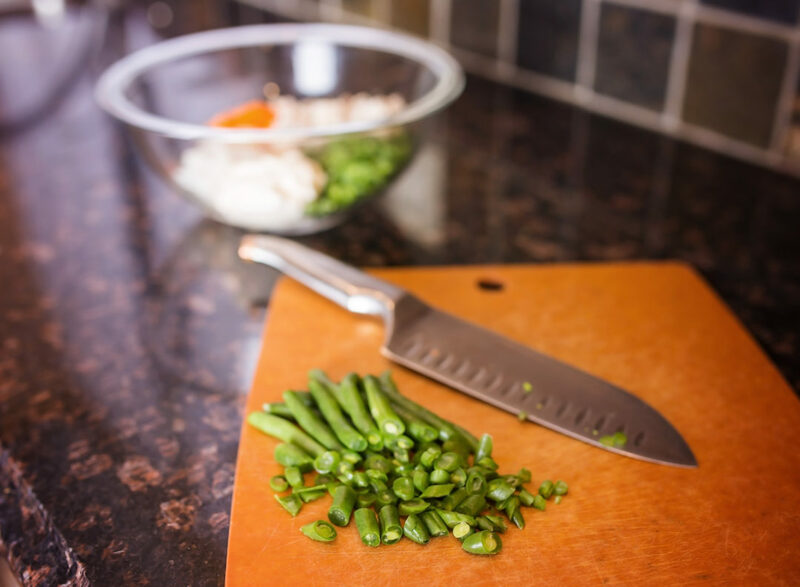 In a bowl, mix onions, carrots, green beans, chicken, garlic, salt, and Hellmann’s® Real Mayonnaise, folding until ingredients are well-combined. 3. 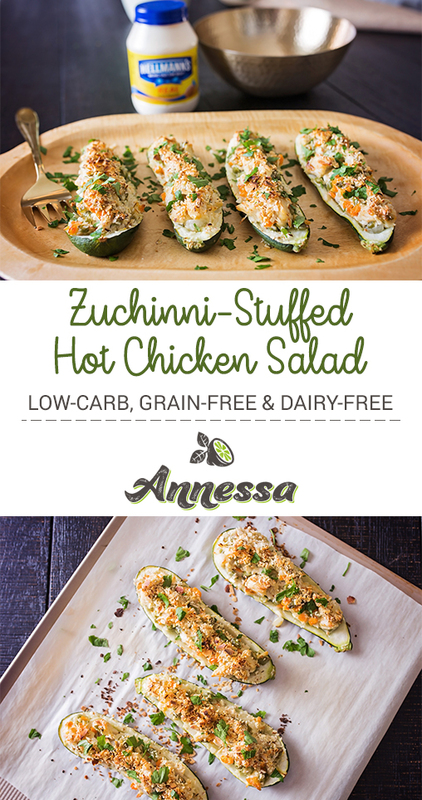 Divide chicken salad among each zucchini, mounding it up in the middle. 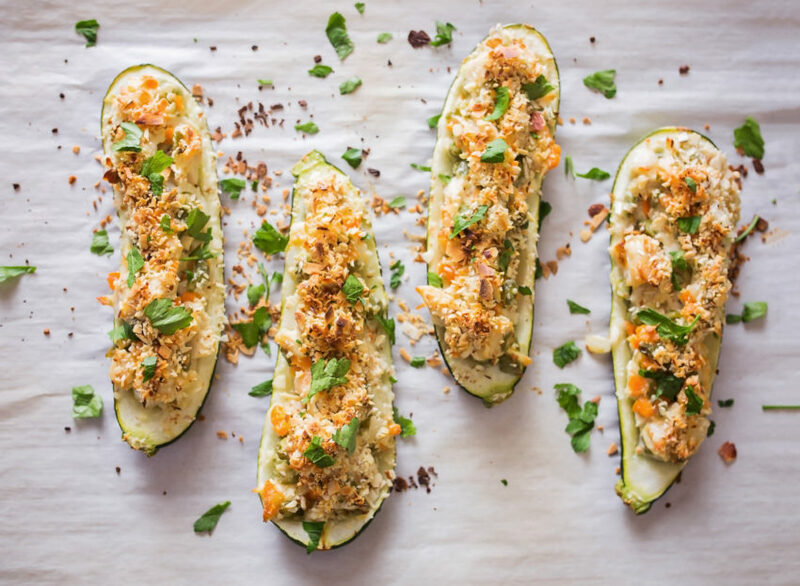 Sprinkle the top of each zucchini with crushed almonds. 4. Bake for 35 minutes. Remove, let cool and enjoy!